The bus provider, Bay Area Transport Services, is owned by a former County Board of Education trustee. 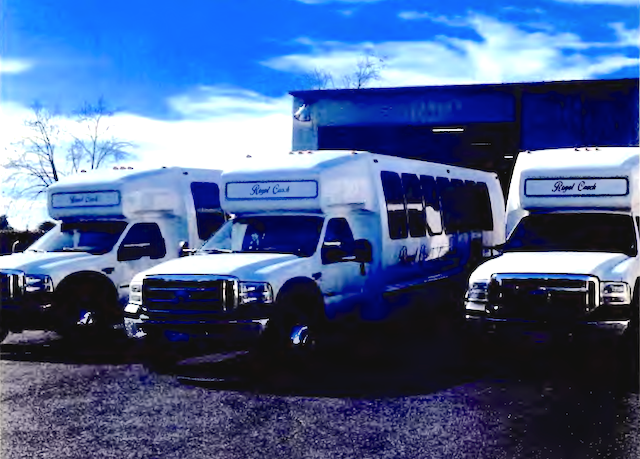 A photocopy image of the buses provided by Bay Area Transport Services to the Oakland Athletic League. Recent news that the Oakland Unified School District planned to cut athletics programs by as much as $500,000 due to ongoing budget problems caused an uproar among parents and students. In response, private contributions have saved some sports offerings. But the school district's athletics program itself illustrates how OUSD has failed to implement spending controls, causing deficits and forcing the school board to make numerous and often surprising cuts. For example, since 2016 OUSD's athletics program, which has a $1.6 million annual budget, spent over $134,000 on bus transport services for students without ever putting the work up for competitive bidding. District staff also never sought approval for the expensive bus services from the school district's board, as they're required to by law. And the money wasn't accounted for in the budget, making the district's financial situation even worse. The company that got the no-bid work was Bay Area Transport Services, or BATS. BATS is owned and operated by Marlon McWilson, a former trustee of the Alameda County Board of Education who was in office from 2009 to 2016. The county board and superintendent have certain oversight powers over OUSD. The county superintendent is responsible for reviewing and approving OUSD's budget, while the full board of education can can approve or deny charter school applications. According to OUSD records, McWilson's company began providing bus services to the district beginning in at least January 2016, while he was still a member of the county board of education. But this work didn't go through the proper contracting procedures. Instead, OUSD staff simply hired McWilson's company and began paying BATS to transport students to and from games and tournaments. In May 2016, four months after BATS started working for OUSD, district staff brought a $45,000 contract to the school board for approval. The board unanimously passed the contract, but it was entirely retroactive because it covered work that had already been completed by BATS between January and April of 2016. Bernard McCune, an OUSD official, wrote that the retroactive $45,000 contract was appropriate because BATS' prices "compared with other vendors." But OUSD never put the work out to bid, so it's unclear how exactly they compared prices in the market. According to OUSD, McCune no longer works for the district and the Express was unable to locate him for comment. Last September, BATS was again selected by OUSD and OAL staff without any competitive bidding to shuttle students to and from sporting events. Eight months later, at a school board meeting in May of this year, OUSD staff admitted that they improperly recruited the contractor through a no-bid process, and that they had already paid BATS $82,000 without ever signing an agreement or having the school board take a vote. Bay Area Transport Services also billed OUSD for another $76,000 in services on top of the $82,000 already paid out, according to district officials. "It doesn’t meet legal requirements for competitive bidding," OUSD General Counsel Marion McWilliams told the board during the May meeting. "Fundamentally, we believe it is an unlawful contract." As a result, OUSD's board pulled the proposed contract off its consent calendar to discuss it further. Several school board members advocated for approving the contract, with a proposed total payment of as much as $215,000. Board member Roseann Torres said that McWilson's company had already completed the work and, regardless of whether OUSD complied with the law and its own policies, BATS should be reimbursed, she argued. Other school board members agreed that BATS should be paid for the work already done, but countered that the contract, which included additional future work, shouldn't be approved. "By approving this contract, we are reinforcing bad behavior on multiple levels," said OUSD board member Aimee Eng. School board member Jumoke Hinton-Hodge called McWilson a valued local contractor and said it appeared that his company was being unfairly singled out from among the district's many vendors who have obtained work without going through the proper channels. "This is definitely a process issue, a big one," said board member Nina Senn, who opposed the contract. "And we do have to hold the line. We do have to have discipline around our contracting." Eng, Jody London, Shanthi Gonzales, and Senn voted against the contract, which failed to pass. McWilson's personal contacts at OUSD (he formerly worked at OUSD as a teacher) appear to have given him a leg up in obtaining work from the school district without any formal bidding process. To justify the first $45,000 retroactive bus contract with BATS in 2016, the OUSD staff member in charge of the procurement, McCune, wrote that he "worked with vendor previously at OUSD." "I've been associated with the district for over 25 years, from mentoring to teaching," McWilson told the Express earlier this week. McWilson served on the Alameda County Board of Education up until June 28, 2016. According to OUSD records, his bus company was working for OUSD starting in January of 2016, but McWilson did not disclose owning a bus company and contracting with OUSD on his statement of economic interest form filed in February of 2016, disclosing his sources of income in advance of that year's County Board of Education Election, for which he was a candidate. McWilson lost the election to Amber Childress and left the County Board of Education in June 2016. As a trustee, McWilson routinely voted on matters affecting OUSD. Acknowledging the previous methods were illegal, OUSD issued a public request for proposals on June 20 seeking a new bus services provider. Several companies submitted bids, including McWilson's. In the end, OUSD staff ended up recommending that McWilson again be provided the contract, now valued at $300,000 and running through 2021. The school board is scheduled to vote on the new proposed contract with BATS in September. Clarification: the original version of this story stated that the county office of education has the power to review and approve OUSD's budget. In fact, the county superintendent has specific oversight authority over local school district budgets - not the county school board.